I managed to catch one of these carp and it was a beautiful strong fish. This carp was quite preoccupied with feeding and was doing that curious “mud shuffle” motion where it rocked from side to side, its upper back sometimes coming clear of the water. It was just on the other side of some bank side rushes, more or less at my feet, nosing right in against the bank. I tried an awkward lob to land the nymph close to its head but the odds were always going to be against me. So I waited until it had shuffled a little way along the bank and stepped quietly into the river myself. It is worth persisting with casting for these fish. If a good cast has resulted in no response it can simply mean that the mud displaced by the fishes feeding has simply obscured it. I certainly cast many times to this fish before finally hooking it. The successful cast was maybe a foot in front of its head. When its shuffling brought it over where I though the nymph should be I simple tightened up gently and everything went solid. One of the big fears when fishing like this is of foul hooking the fish and often you don´t know whether the nymph was taken properly until well into the fight or even the moment the fish is finally beached. This part of the pool is, thankfully, clear of snags and so the odds were decidedly in my favour. 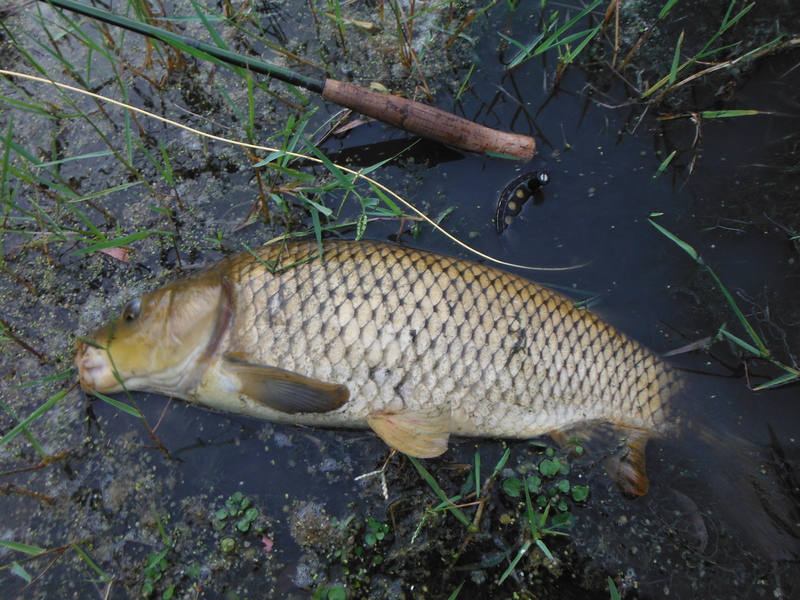 After a strong fight I beached the carp in the muddy margin. It was pleasing to see that the fish had indeed ingested the nymph and it seems to have done so enthusiastically because I needed to use forceps to extract the barbless nymph. I suppose the fish saw the fly, opened its big gob and just hoovered it in. It was kind of a relief after a succession of refusals by the über-wary fish I had encountered in the morning, to see one of these things just gobble up the fly, no questions asked. After extracting the nymph and taking a few photos I took the carp into knee depth water and supported it while it caught its breath. It is lovely to see these things rest in your hands. The tubular mouth opens and closes and pushing water through the gills and the eyes shift here and there. It was quite a chunky fish, broad in the back, and I thought it would be nice to photograph is as it was supported in this way. Of course I needed to remove a supporting hand in order to grab the camera from my pocket and, in the same instant the carp gave a push with its great spade tail and glided off into the river. Beautiful fish.